Real Estate: Investors and developers are increasing their exposure in mixed use developments in Kenya in a bid to (i) increase returns, (ii) use available land efficiently, (iii) stay relevant, and (iv) increase their occupancy levels. Konza Technopolis Development Authority (KoTDA) launched their 5-year strategic plan to boost investments and developments in the masterplan. We continue to beef up the team with several ongoing hires: Careers at Cytonn. During the week, T-bills were oversubscribed with overall subscription coming in at 135.3%, compared to 72.7% recorded the previous week. The increase in subscription levels for T-bills can be attributed to increased participation by investors who were not successful in last week?s 2-year Treasury bond auction, which received bids worth Kshs 35.5 bn with only Kshs 10.5 bn being accepted. Subscription rates on the 91, 182 and 364-day papers came in at 92.2%, 264.1% and 35.3%, from 64.7%, 124.1% and 26.6%, respectively, the previous week. The 182-day paper continues to offer investors the best returns on a risk-adjusted basis and hence received the highest subscription level. Yields on the 91-day T-bill increased to 8.6%, from 8.5% the previous week, whereas yields on the 182-day and 364-day T-bills decreased to 10.5% and 11.0% from 10.6% and 11.1% recorded the previous week, respectively. The 91-day T-bill is currently trading below its 5-year average of 10.4%. The lower yield on the 91-day paper is mainly attributed to the expected low interest rates environment following (i) the operationalization of the Banking Act (Amendment) 2015, which has led to more liquidity in the money market given reduced lending to the private sector, and (ii) reduced pressure from the government borrowing program as they are currently ahead of the pro-rated domestic borrowing target of Kshs 114.8 bn, having borrowed Kshs 155.7 bn, which is 135.7% of the pro-rated target. It is important to note that the government is in the process of revising its domestic borrowing target upwards to Kshs 294.6 bn from Kshs. 229.6 bn, which if passed by Parliament, will take the pro-rated borrowing target to Kshs 147.3 bn, meaning that the government will still be ahead of the borrowing target. Key to note is that the interest rates bottomed out in July and we expect them to persist at the current levels, having risen slightly over the past few months since. The CBK Weekly Report revealed that the interbank rate decreased by 80 bps to 4.4%, from 5.2% registered the previous week, on account of a net liquidity injection of Kshs 23.8 bn, which was driven by an increase in reverse repo purchases that grew to Kshs 18.5 bn, from Kshs 12.7 bn the previous week, and Treasury bond redemptions that came in at Kshs 29.4 bn. As highlighted in our Cytonn Weekly #28, the interbank rate is often determined by the liquidity distributions within the banking sector as opposed to the net liquidity position in the interbank market. The government has re-opened the recently issued 2-year bond to raise Kshs 20.0 bn for budgetary support through a tap sale. The tap sale, which will be open to investors up until December 29th 2016, will see investors participate at the weighted average rate of accepted bids in the initial auction, which is at 12.5%. In as much as this tap sale will enable the government to raise the additional amount of Kshs 20.0 bn at the auction yield of 12.5%, it is our view that secondary market activities are likely to remain subdued during the coming week as investors shift their attention to the tap sale. These frequent tap sales by the government is making it extremely difficult for the active bond traders, who usually buy in the primary market and sell in the secondary market, to be able to exit their positions and also make returns given the lower demand in the secondary market as a result of investors participating in the tap sales. According to Bloomberg, yields on the 5-year and 10-year Eurobonds decreased week on week by 30 bps and 20 bps to 4.7% and 7.8%, down from 5.0% and 8.0%, respectively, the previous week. The decrease in yields is attributed to a market correction following the high increase in yields seen last week brought about by the Fed increasing interest rates by 25 bps, after which investors demanded an equivalent premium in emerging market debt, to compensate for the relative risk. Since the mid-January 2016 peak, yields on the Kenya Eurobonds have declined by 4.1% points and 1.9% points, respectively, for the 5-year and 10-year bond due to improving macroeconomic conditions. This is an indication that Kenya remains an attractive investment destination. The Kenya Shilling remained relatively flat this week, losing marginally by 0.1% against the dollar to close the week at Kshs 102.4, from Kshs 102.2 the previous week. The shilling continues to remain stable despite the 25 bps hike in the Federal Funds Rate last week, which has seen the dollar strengthen globally. We expect the shilling to remain stable for the short-term given the low dollar demand from corporates over the next few weeks. On a year to date basis, the shilling is flat against the dollar, with the 0.1% depreciation this week wiping out any gains made during the year. In recent weeks, we have seen the forex reserves reduce to USD 7.0 bn, from USD 7.8 bn in October, which has led to the decline in the months of import cover below the 1-year average of 4.9 months, and is currently at 4.60 months, down from 4.74 months recorded the previous week, implying that Central Bank used USD 219 mn of reserves to support the shilling this week. Just 2-months ago, on 6th October 2016, there was 5.2 months of import cover. As stated in our Cytonn Weekly #45, this is worrying as the rate of decrease in the reserves could be an indication that the CBK is using a lot of reserves to support the shilling, and may continue to do so in the near-term given the global strengthening of the dollar. The Government of Kenya has managed to secure Kshs 11.0 bn funding from the European Union (EU) that will be channeled towards enhancing food security and drought mitigation programs. The government plans to allocate the funds in a number of ways, including (i) Kshs 5.3 bn in supporting smallholder agriculture productivity, agricultural research, food quality and safety, (ii) Kshs 3.6 bn in enhancing legal empowerment and aid delivery, and (iii) Kshs 2.1 bn into the implementation of ?Kenya?s Ending Drought Emergencies Strategy?, a program introduced by the government together with development partners in a bid to reign in on drought. The food security and drought mitigation programs are intended to promote the establishment of Public-Private community partnerships and in the process, facilitate the role of the private sector in nation building. The food situation in the country had taken a hit 2-months ago, following an audit report that claimed over 754,000 bags of maize valued at Kshs 1.8 bn stored at the National Cereals and Produce Board (NCPB) depots was unfit for consumption. The move by the government is expected to go a long way in improving the food situation in the country and in the process, propel economic growth by enhancing farm productivity, given that the agricultural sector contributes 23.1% of Kenya?s GDP. The trend in Kenya?s debt position is concerning and will only add to the country?s rising debt burden currently at 50.3% of GDP, from about 40% 3-years ago; we are already above the IMF recommendation of 50.0% of debt to GDP. Following the recent Fed rate hike and expected tightening cycle of monetary policy in the US, which is expected to lead to a global strengthening of the dollar, a stronger dollar will make debt repayment expensive for Kenya. This is because with a stronger dollar, we shall owe more shillings for every unit of foreign denominated debt, worsening the debt to GDP situation even further. The Government is ahead of its domestic borrowing for this fiscal year having borrowed Kshs 155.7 bn for the current fiscal year against a target of Kshs 114.8 bn (assuming a pro-rated borrowing throughout the financial year of Kshs 229.6 bn budgeted for the full financial year). It is important to note, however, that the government is in the process of revising its domestic borrowing target upwards to Kshs 294.6 bn, which will take the pro-rated borrowing target to Kshs 147.3 bn, and the government will still be ahead of the borrowing target. Interest rates, which had reversed trends due to the enactment of The Banking Act (Amendment), 2015, appear to have bottomed out in July and we expect them to persist at the current levels, having risen slightly over the last few months. It is due to this that we think it is prudent for investors to be biased towards short-term fixed income instruments given the prevailing interest rates environment. During the week, the Kenyan equities market was on a mixed trend, with NASI and NSE 20 gaining by 0.8% and 0.3%, respectively, while NSE 25 declined by 0.3%, taking their YTD performances to (9.5%), (22.9%) and (17.6%), respectively. Performance was driven by gains in select large cap stocks such as Safaricom, which gained 4.0%. Since the February 2015 peak, the market has lost 25.7% and 43.4% for NASI and NSE 20, respectively. Equities turnover increased by 27.4% to close the week at USD 19.4 mn, from USD 15.3 mn the previous week. Foreign investors were net buyers with net inflows rising by 175% to USD 5.5 mn from USD 2.0 mn recorded the previous week, with foreign investor participation decreasing to 69.3% from 76.6% recorded the previous week. Safaricom was the top mover for the week accounting for 44.5% of market activity. We maintain our expectation of stronger earnings in 2016 compared to 2015 supported by a favorable macroeconomic environment. However, the key risk lies within the banking sector, following the implementation of the Banking Act (Amendment) 2015, which stipulates the loan and deposit pricing framework. With the banking sector still dependent on interest income, which as per results released in Q3?2016 was at 72.0% of total operating income, volatility in this revenue stream may depress earnings for banks, especially during the fourth quarter. 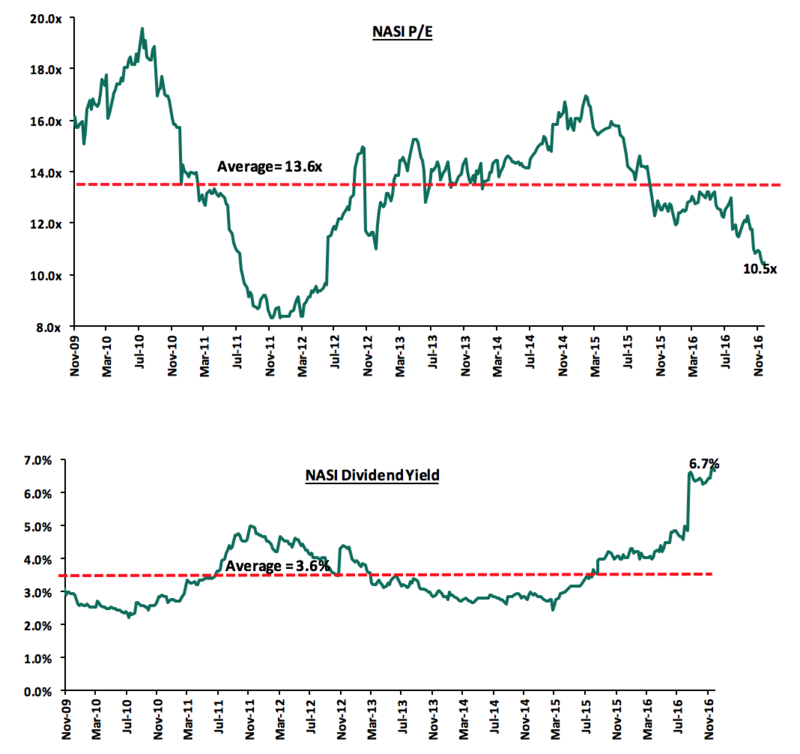 The market is currently trading at a price to earnings ratio of 10.5x, versus a historical average of 13.6x, with a dividend yield of 6.7% versus a historical average of 3.6%. The charts below indicate the historical P/E and dividend yields of the market. The Capital Markets Authority (CMA) issued a circular requiring Collective Investment Schemes, managed by investment advisers or fund managers, to disclose their distribution of term deposits and cash across Tier 1, 2 and 3 banks, in line with a new reporting format that will be implemented at the end of this month. This follows the placing under receivership of 3-banks, namely Chase Bank, Imperial Bank and Dubai Bank, locking away customer deposits. Collective Investment Schemes control Kshs 52.1 bn worth of investments as at H1?2016, and are a long-term savings plan for many. By being required to disclose where they are banking the investors? funds, investment schemes will be more rigorous in analyzing banks that form the panel they can place funds with. The effects of this will be: (i) investment schemes will have to look at a bank?s financial stability and governance in addition to returns when investing, which include capital adequacy, asset quality, management quality, earnings quality and liquidity, (ii) small and weaker banks will have to look for alternative sources of funding as higher rates will not be enough to attract the investment schemes deposits, (iii) the CMA will be able to monitor investor risk, thus enabling regulatory intervention where need be, and (iv) the greater transparency as to how investor funds are allocated to banks will enable investors and stakeholders to interrogate methodology of allocation; there have been market reports that some market participants may have allocated deposits with incentive of getting back commissions from the receiving bank. In our view, this is a very positive development in terms of enhancing reporting and transparency by Collective Investment Schemes and going forward the competition is going to be around not only the return, but also based on the risk given the areas where funds are invested. We hope that the disclosure will go much further than just disclosing the bank Tiers, but also disclosing the specific banks and also disclosing where an entire CIS portfolio is invested. Nation Media Group (NMG) has announced a downsizing of their workforce in January 2017 to reduce job redundancies, following the launch of the Group?s new strategy in June this year. The strategy aims to transform the group into a modern 21st Century digital company through (i) focusing on the digital segment, (ii) scaling down of radio business in Kenya & Rwanda, and (iii) consolidating NTV & QTV into one multi-lingual TV station. The strategy will allow NMG to (i) improve on cost containment by reducing staff costs, thus further keeping operating expenses in check, as witnessed in the company?s FY?2016 results where operating expenses declined 2.2% to Kshs 9.5 bn from Kshs 9.7 bn, and (ii) grow their revenue streams through digital media, while securing their print and broadcasting business in a more efficient way. As highlighted in our Cytonn Weekly #12, the company?s profitability will benefit greatly from the more efficient printing press. How effectively they can harness advertising revenues from their digital platforms will also be a major contributor to their revenue growth, given online viewership of Daily Nation has grown from just over 20 mn page views in 2012 to almost 90 mn in early 2016. We remain ?neutral with a bias to positive? for investors with short to medium-term investments horizon and are ?positive? for investors with long-term investments horizon. On the fundraising front, Fairfax Africa Holdings Corporation, an investment holding company for Canadian insurer Fairfax Financial Holdings Ltd, is seeking to raise USD 1 bn for investing in public and private equity securities and debt instruments of African businesses or other businesses with customers, suppliers or business primarily conducted in, or dependent on, Africa. The firm is seeking to raise the funds through an Initial Public Offering on the Canadian (Toronto) bourse, having already secured close to USD 416 mn from its own funds and partners. This will be the insurer?s 2nd public fund specific to a region, as 2-years ago Fairfax offered shares in an investment vehicle that targeted Indian firms, securing Canadian Dollars 500 mn from partners and its own funds, and raising about USD 1 bn. The fund seeks to take advantage of the opportunities arising from fast economic growth in Africa, believing that Africa will be transformed in the coming years by (i) positive demographic trends led by a large emerging middle class, (ii) substantially improved political stability and governance, and (iii) increased integration with global markets. This is a positive development in our view, as more global capital is being raised to fund enterprises in Africa, and especially that these North American investors, where we previously had not seen much fundraising activity geared towards Africa, also increasing their allocation to Africa, driven by attractive returns and deepening markets. Fuzu, a Kenyan based online jobs search website, received an investment commitment of Kshs 186.0. mn from 3 investors, namely: (i) Finnfund, a Finnish development finance company, that provides long-term investment loans and risk capital for private projects in developing countries, (ii) Barona Technologies Oy, a Finnish company that offers solutions aimed at improving matching of job hunters and employers, and (iii) Polkuni Oy, a Helsinki and Hong Kong based brand that co-develops products with a hands-on investment approach. Fuzu has been in operation since September 2015, receiving more than 16,000 applications in 2016, with users spending an average of 9-minutes on the job portal. Finnfund?s contribution in the first phase will be EUR 500,000 with the possibility for extending it to EUR 1.5 mn, while Barona and Polkuni will invest EUR 150,000 and EUR 100,000, respectively, for an undisclosed stake in the company. Fuzu will use the funds to finance growth of the job portal?s operations in Kenya as well as across Africa and other emerging markets including Asia. The portal seeks to help tackle the problem of youth unemployment, with more than 120 million people expected to enter Africa?s job market between 2010 and 2020 alone. Sanlam, a South African financial services group, and its short-term insurance subsidiary Santam, are set to increase their stake in Saham Finances by a further 16.6% to 46.6%, from 30.0% held currently, subject to regulatory approvals. Saham Finances is an insurance group that predominantly writes general insurance business, and has operations in 26 countries across North, West and East Africa, and the Middle East. The deal that will cost USD 329.0 mn and values the firm at USD 2.0 bn is expected to be complete in Q2?2017. On completion of the transaction, Sanlam Emerging Markets (SEM) will hold 75.0% and Santam 25.0% of the stake through a special purpose vehicle. The transaction is set to expand Sanlam Group?s footprint across the African continent with entry into new attractive markets in line with their diversification strategy, giving them access to a diversified blend of new high-growth insurance markets in North and West Africa, which are largely underpenetrated. The insurance company has operations in Cote d?Ivoire, Gabon, Senegal and Cameroon in West Africa; the North African country of Morocco and Lebanon in the Middle East, and Angola in Southern Africa, among others, giving it a competitive regional network advantage. This indicates continued interest in the fast growing financial services industry in Africa. Telkom Kenya will rebrand in April under Helios, a private equity firm. The telecommunication firm has however not disclosed the name it is planning to rebrand to. Helios acquired 70% stake in Telkom in June, while the government owned 30%. Helios later ceded 10% of the stake to the government bringing the Treasury stake to 40.0%, with Helios at 60.0%. It had been stipulated in the agreement that the company would continue to use the Orange brand for 18-months. At the point of acquisition, Telkom was underperforming as Safaricom dominated the market. Helios put in place growth strategies including (i) change of management, (ii) provision of cheaper affordable services, and (iii) investing in new undersea cables to connect Kenya to international markets. It will be interesting to witness if the new brand can capture the Kenyan market, as most Kenyans would like to have a credible alternative to the dominance of Safaricom. Private equity investment activity in Africa has continued to increase, as evidenced by the increase in fundraising activity and deal volumes in the region. Preference is still skewed towards financial services, agriculture, and technology sectors although infrastructure and Fast Moving Consumer Goods (FMCG) industries have now gained traction. We remain bullish on PE as an asset class in Sub-Saharan Africa given (i) the abundance of global capital looking for investment opportunities in Africa, (ii) attractive valuations in the private sector, and (iii) strong economic growth projections, compared to global markets. During the week, Crowne Plaza Hotel Nairobi ventured into mixed use developments (MUD?s), opening Grade-A offices alongside its mainstream hotel business in Upperhill. The 36,000 square-foot development dubbed ?Crowne Plaza Annexe? will be an extension of the already existing hotel building and will house an extra 44 rooms as well as the grade A office space. The total number of rooms in the hotel will thus increase to 206, up from 162 before the expansion. The management cited increased demand for parking space, accommodation, and conference rooms as the main reason behind the expansion. Efficient Use of Space: As Nairobi becomes increasingly developed, lesser space is available for development, hence MUD?s are ideal to facilitate efficient use of space. Also during the week, Konza Technopolis Development Authority (KoTDA) launched a new 5-year plan to drive development and investment in Konza City. Konza City, one of Kenya?s upcoming master planned cities is aimed at becoming a hub for technology, and is dubbed the ?African Silicon Savannah?. It was launched in 2013, but the development has not taken up fully due to financial and organisational challenges. The strategic plan is hence a new lease of life for the masterplan, and if implemented it will drive investments and much needed development. At the launch, Information Communication, and Technology (ICT) Permanent Secretary Joe Mucheru informed the public that a main contractor had been procured. The contractor, who is to also provide financing, will begin the construction of streetscape and subsurface utilities including water, solid waste treatment as well as fibre optic reticulation and power / electrical distribution. Phase 1 A will be set on 60-acres and the government plans to lease all the 60-acres by March 2017. Real estate as an asset class continues to attract investments in the country, especially now towards mixed use developments. This is a trend that is likely to continue as investors remain bullish about real estate as an asset class, attracted by the high returns being earned in the sector.